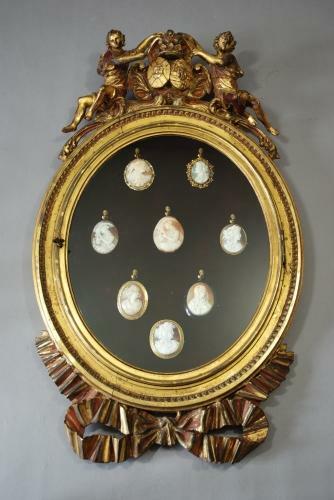 A mid 19thc highly decorative carved & gilded Continental (possibly French or Italian) oval hanging display case, originally for miniatures. On the top of the piece sit two carved walnut figures, one female, one male, supporting a coat of arms with a coronet. There are two oval shields, the left with a cross & an oval centre with a Z, the other consists of two crowns, central panel depicting a double headed eagle & some bell shaped carvings. An oval carved moulding surrounds the frame & at the base is a carved, gathered bow. It has a lockable glazed door with original glass & the original key. The interior consists of a red velvet background with 7 ormolu bearded male figures that act as hooks for the miniatures. This piece would have originally been made for an important family & is a rare find. Please note cameos are not for sale, but purely for display purposes.